Hey friends! I feel like lately every blog post has started with an apology for my lack of blogging. The reality is that with beautiful weather and kid’s home we’ve been too busy enjoying summer to do house projects. 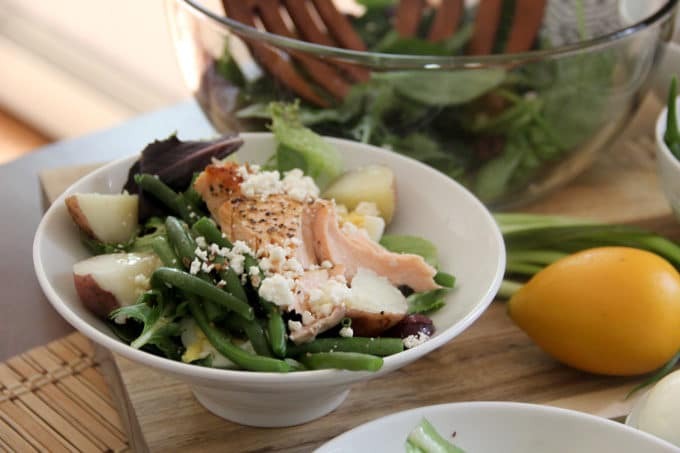 Although we haven’t been project-ing I did make this AMAZING nicoise Salmon Salad that I wanted to share with you all! A few years ago my mom made this salad and I remember thinking it was SO weird. 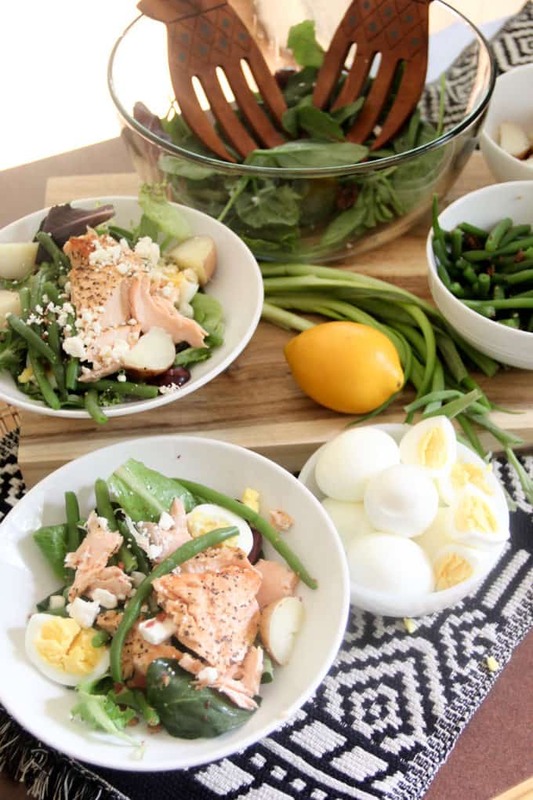 A salad with potatoes, green beans, and eggs in it? I gave it a shot though and discovered what an amazing combination it actually was! Fast forward a few years and I found myself wanting to make a savory salad. 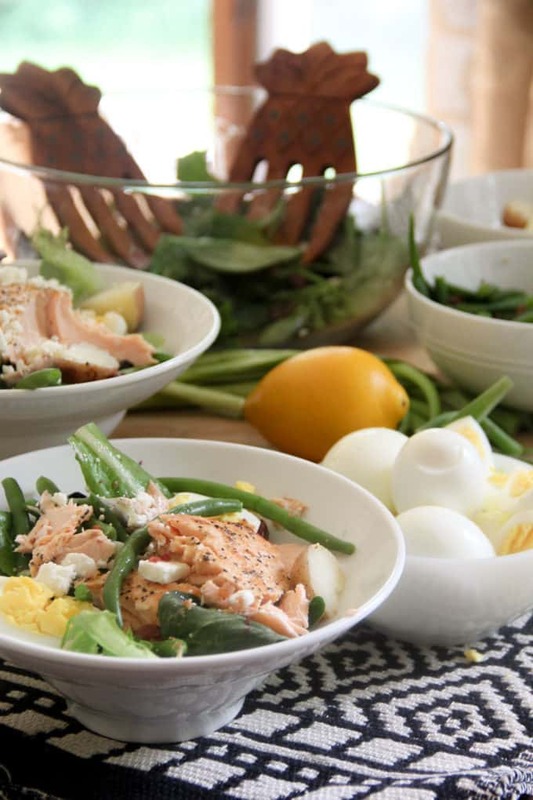 After some google research I found that it is a “Nicoise” salad coming from the town of Nice in France. 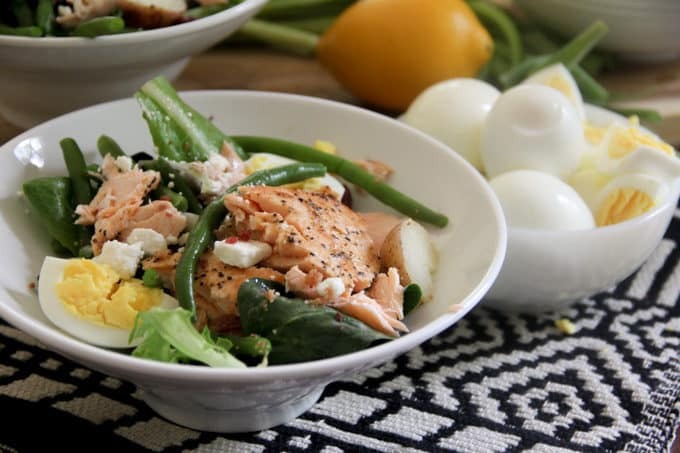 The definition of a Nicoise salad is one that is “composed” of unique ingredients, typically including green beans, potatoes, and eggs. 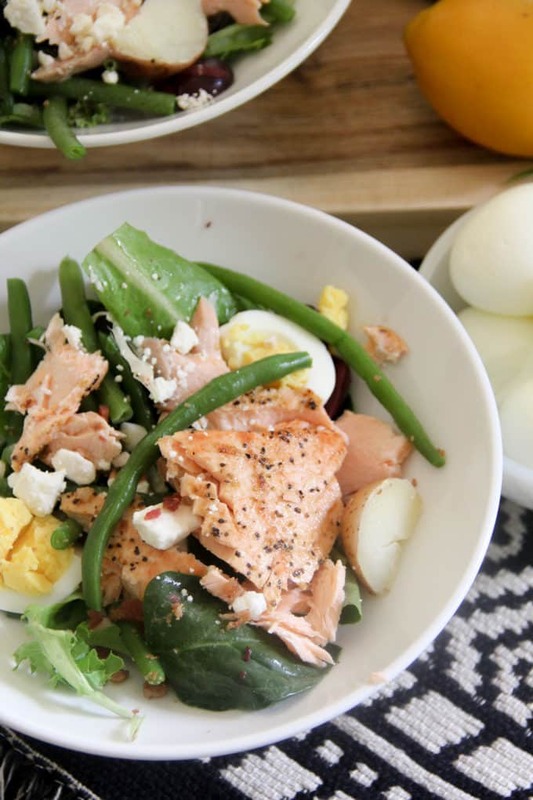 This salad is definitely delicious, but takes some good prep time. 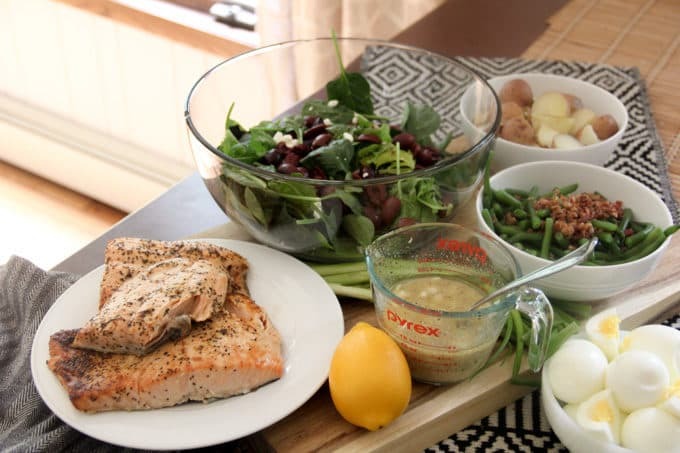 It includes broiling the salmon, cooking the green beans, boiling the eggs, and boiling the potatoes. After that it’s mostly just assembly. 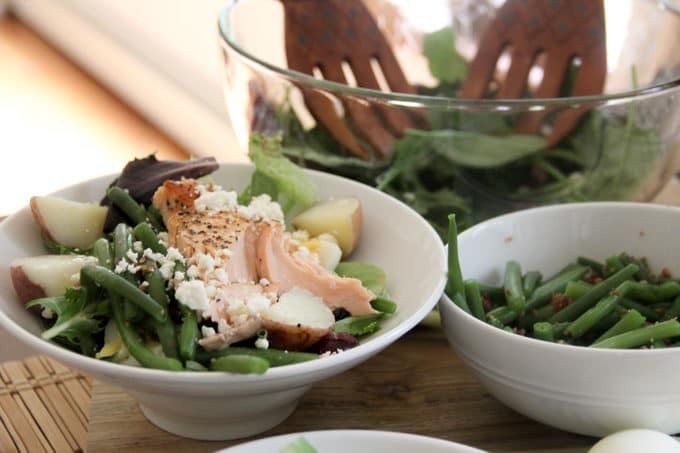 My husband is one of those men that believes that salads are a side dish, not an entrée. This salad though, even he agreed was worthy of being called an entrée! Another bonus was that our boys who are 6 & 7 LOVED it an ate every last bite. My favorite part of this salad is the kalamata olives. I think that add such an amazing salty kick that this salad would not be the same without them! To save the trouble of cooking bacon for the bacon bits, I just buy the pre-made packaged kind. 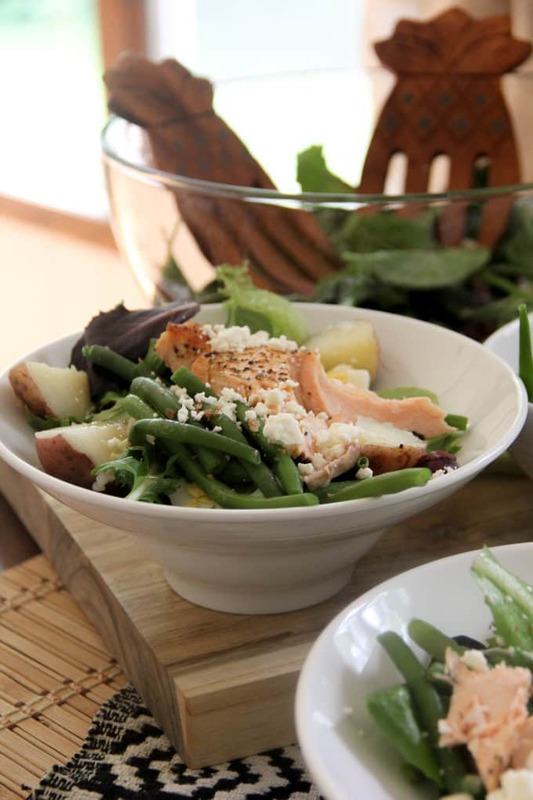 This meal is also made easier by cooking the potatoes for a prior meal, and then just using them in the salad. I don’t know if it even matters whether the potatoes are hot or cold. I served them hot, but I think they’d be good cooled too. 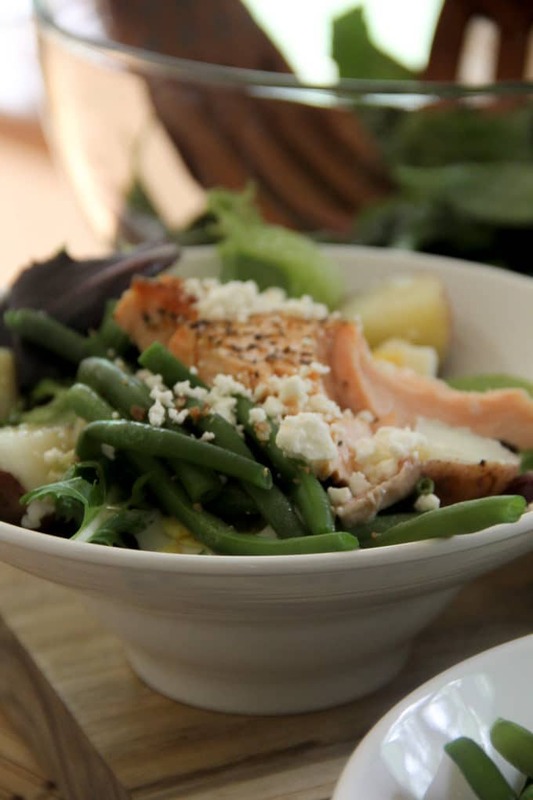 Along with loving the kalamata olives, I think that adding crumbled feta puts this salad over the top. 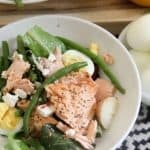 Although this salad takes some prep time, it is SO worth it and tastes AMAZING. This would make a great girls lunch meal, or a nice savory dinner. I hope you love it as much as we do! « Five on Friday- Watch, Read, and Listen.